Gabriel and I were hungry after class at Family Tree Yoga ( http://familytreeyogasrq.com ) on Tuesday night (taught by my hunky honey ( www.magicsandbox.com ) so we decided to check Yelp for somewhere close by with great Thai food. When Isan came up, we thought it was be a perfect idea. I actually pass it frequently since I work nearby and often go to Phillippi Creek park on my lunch breaks to read…I just had no idea that it had so many great reviews. We walked in to find a sparkling clean establishment with pretty, carved-wood booths and smiling waitresses dressed in traditional Thai outfits. Our menus and waters were brought over promptly and we took a few minutes to decide what we wanted to order. We started with the shrimp fresh rolls and the cucumber salad. Both were served quickly, filled with crisp, fresh, bright, ingredients and flavored simply. 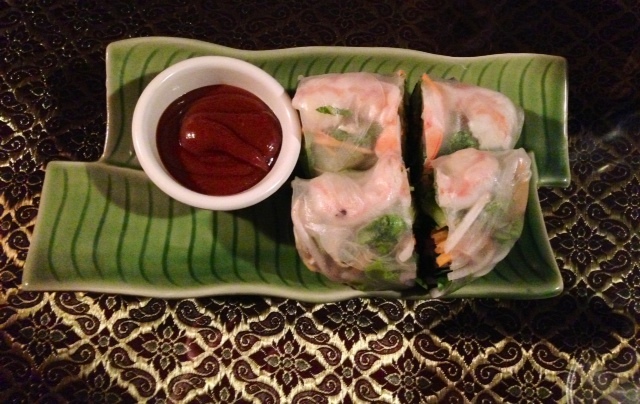 The peanut dipping sauce for the rolls had a creamy, rich taste, and was smoother than most peanut sauces I’ve had. I believe it had more Hoisin sauce than I’m used to, and I really enjoyed that. The cucumber salad was dressed lightly with a little vinegar and maybe some lemon and olive oil. It was a subtle dressing that allowed the flavor of the various vegetables to come through. 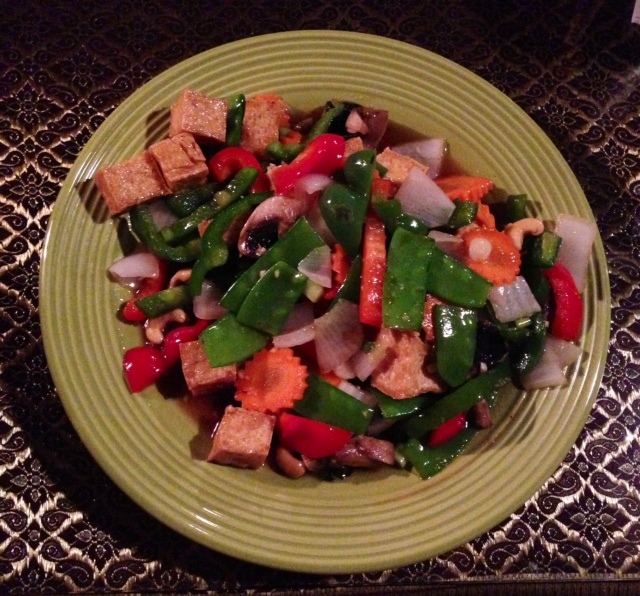 For my entree, I had the cashew nut tofu and vegetables. It was a generous portion of colorful veggies with a light sauce. I would have like more cashews- they were quite few and far between, but the relatively small number of them DID make for a super healthy entree and I was happy about that. The tofu was lightly pan fried- with little or no breading- exactly the way I like it. I asked for no rice knowing that the fresh mango-coconut sticky rice dessert would be calling my name. Half of that carb-y dessert would be plenty of starch for me, and I knew I didn’t need to fill up on rice with my entree also with such a plentiful plate of vegetables. The dessert was awesome. The chunks of mango were sweet and juicy and the coconut sauce over the sticky rice was heaven. This is historically one of my favorite desserts, and though I’ve never had a version as unbelievably addictive as the one from Land in NYC ( https://bigforkinmouth.com/2010/04/22/land-northeast-thai-1565-2nd-avenue-new-york-ny ) this was came pretty close and Gabriel and I demolished it in less than 5 minutes. Both of us really enjoyed our dinners and the attentive waitresses. The setting was much prettier on the inside than we expected from the outside. My only complaint was that it was freezing inside and I really wished I had a sweater. 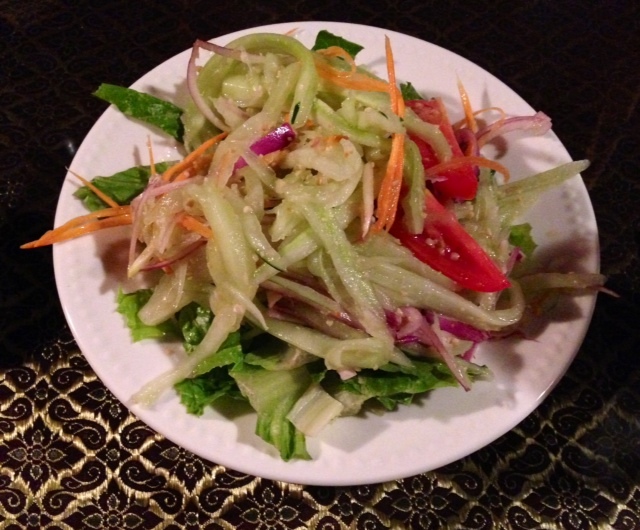 Otherwise, I was totally impressed with Isan Thai and will definitely return!